San Diego County Animal Services has an unusual mystery to solve after a ball python ended up in a South Park apartment unit last Thursday. The snake was found last Thursday evening inside a bathtub at the Beech Street Knolls Apartments. It did not come from the canyon thicket surrounding complex but more likely from another apartment in the same building. The real concern for the other residents is whether there are more of them in the drain system. The families of Lincoln Military housing are on alert. The enemy, in this case, is a foot-long ball python. "I didn't know if it had venom in it or if it was going to attack us. 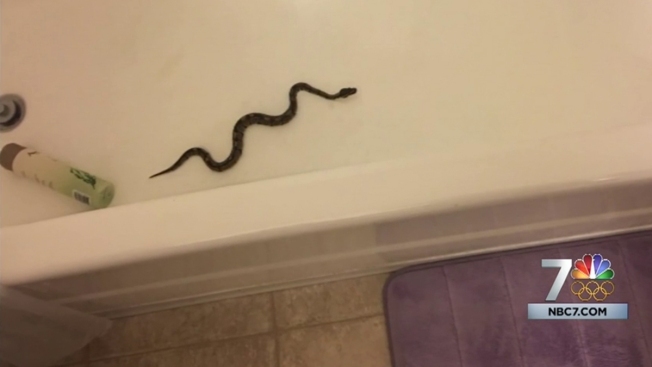 I don't even know how long the snake was in the bathtub,” resident Michelle Lomas said. Visiting cousin Stephanie alerted Navy Logistics Specialist Michelle Lomas and her husband to the intruder. Stephanie discovered the snake curled around the drain when she went to preheat her water for a bath. “I thought she was lying. I was like, there is no possible way,” Lomas said. Her husband kept the python at bay with using a broom handle while she called animal services. Deputy Director of Animal Services Dan Desousa told NBC 7, he suspects the snake is a pet. It probably traveled through the building's drain system and ended up in the Lomas’ bathtub. “This snake is not tall enough to have scaled the side of the bathtub and then fallen in on the other side,” Desousa said. He says the snake appears to be just a couple months old and underweight. This would be the second time a snake has been found in a drain incident in 17 months. A four foot boa constrictor was in the toilet of the bathroom in a downtown San Diego Public Relations Firm January 20-15. It was a tenant's escaped pet. This most recent discovery leaves Beech Street Knolls residents unnerved. “I was thinking that I was looking around hoping there was no snake in here,” neighbor Kevin Hooks said. Residents are questioning what they might be sharing their private time in the bathroom with. Animal Services say if the snake isn't claimed by tonight, they put it up for adoption tomorrow.